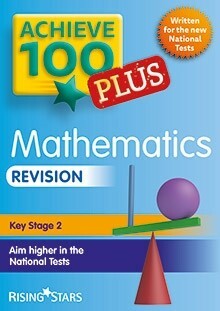 Achieve 100 Plus Maths Revision covers the more demanding areas of the new national curriculum to help more able Year 6 children achieve their best in the new National Tests. A 64-page revision book that covers the more demanding areas of the National Test to help more able children fulfil their full potential. Available as a 15-copy pack This product will be published in October 2015. A 64-page revision book that covers the more demanding areas of the National Test to help more able children fulfil their full potential. With a unique flowchart approach, these books show children how to answer test questions. Use alongside Achieve 100 Plus Mathematics Practice Questions.